An FHA mortgage can save you a lot of money on your home purchase and get you into a new home that much faster. Here's a brief recap of some of the most rewarding FHA loan benefits and what it has to offer. 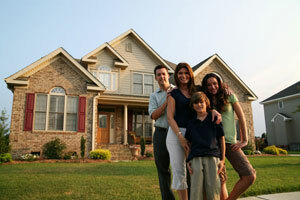 The biggest advantage of FHA loan financing. Relaxed loan eligibility criteria make it easier for college students, first time home buyers, and buyers with less than perfect credit or a flawed credit history to purchase a home. As a federal agency, the FHA does not lend money. Instead, it insures private loans. Removing much of the risk gives private lenders incentive to negotiate favorable qualifying terms for FHA loan applicants. The greatest benefit of the FHA mortgage, allowing first time home buyers who qualify can get into a home with as little as 3.5% of the purchase price down. The FHA does require that the down payment is delivered in cash and not in the form of a second loan, but 3.5% is much easier to come up with than the 20% or more than conventional lenders expect to see. Another benefit of an FHA loan is that borrowers don't need to come up with the down payment themselves. Money for a down payment can be borrowed or given as a gift from a family member or employer and can even be obtained through a charitable organization. A benefit of FHA mortgage loans is that they come with some of the best mortgage rates available. Check with your local FHA Lenders to see what mortgage rates are available to you. Since the government insures all FHA loans, lower rates are available to all potential borrowers, which provides loans to higher-risk applicants and individuals with lower credit scores. An applicant's credit score does not weigh as heavily in the lending decision as it would with a conventional mortgage. Some borrowers with bad credit who would not otherwise qualify for a conventional loan, often qualify for competitive rate government-backed FHA loans. The FHA does not determine the interest rate on FHA loans; private lenders do. That's why interest rates on FHA loans are competitive. The FHA allows your seller to pay for all or a portion of the closing costs of your mortgage deal. In a seller concession, the seller provides you a financial "gift" that you use to pay for closing expenses. This money is then rolled into the total cost of the loan itself. An FHA mortgage provides you access to the FHA Streamline Refinance program, which allows homeowners to refinance their mortgages without the usual hassle and paperwork associated with refinancing. With this benefit, an FHA streamline refinance allows you to close a refinance with minimal effort. Many of the steps in the application process are waived in such a refinance program, allowing FHA borrowers to access capital easily and gain the best mortgage rates at any time. Many homebuyers already expect that they'll need to refinance a few years down the road, and an FHA mortgage can greatly ease the stress involved with this.